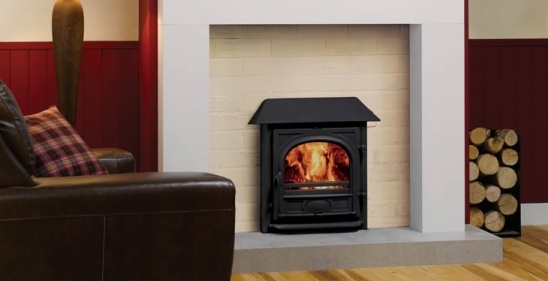 Stockton boiler stoves can supply your domestic hot water and central heating requirements. Or alternatively use ‘link up’ technology to augment a Stockton boiler stove with your existing heating system. Whatever your choice, you will enjoy all the atmosphere of a real fire and exceptional heating performance for other areas of your home. The Stockton 7 Inset Boiler stove can provide up to 4.0kW of heat to a room and up to 7.4kW of heat to a boiler. It is capable of supplying 8 standard sized radiators. Alternatively you can ‘link up’ a Stovax high output boiler with your existing heating system to reduce your reliance on gas or oil. There are ways to link with conventional oil or gas central heating systems, combi boilers, underfloor heating and even solar panels. We recommend reading our further information page before discussing your requirements with a qualified heating engineer. Available in four colours: Matt Black, Metallic Blue, Metallic Brown and Metallic Green. From 1st July 2013 it became a mandatory requirement to have a Thermostat fitted to all boiler stoves. Therefore from this date, all Stovax Boiler stoves now come supplied with a Thermostat as standard.